Sorry......I do not have any copies of this book for sale and I have no idea where to find any. Occasionally copies show up on eBay or ABE books! I am thinking of doing a reprint as I get a lot of requests! Dog Writer's Association of America .....2009 DWAA Writing Competition: Not only did the book win a highly coveted "Maxwell Medallion", but it received the prestigious "President's Award" for best book! It was chosen from all the winners of the individual categories by the DWAA President, Dr. Carmen Battaglia! Best in Show over all the submissions...WOW! What an honor! 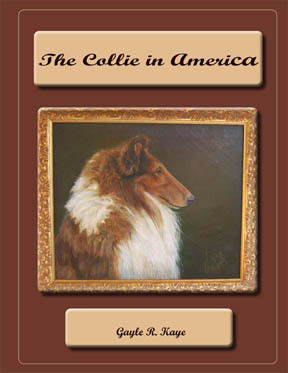 To date, this is the most concise and detailed book ever written on Collie development, history & evolution! A LIMITED EDITION printing of 500, this book is an 8½ X 11 (coffee table size) hardbound with a color dust jacket! Approximately 480 pages loaded with lots of history and Black & White photos (many of them never seen before). Written by noted award winning writer, respected breed authority and historian, this book has the makings of a classic! So far response has been overwhelming, so dont miss out!